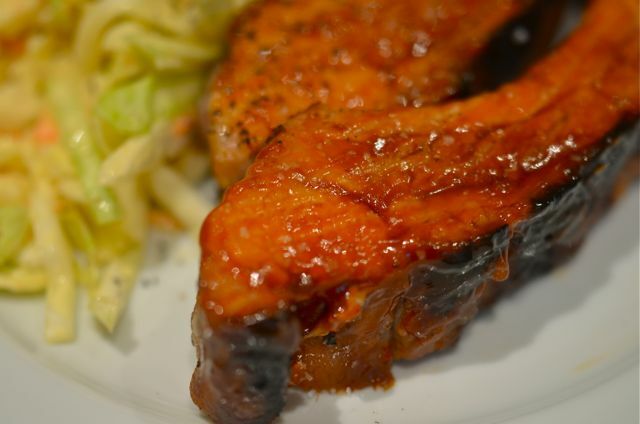 Easy Oven Ribs With Sriracha Barbecue Sauce. We do love our ribs here at the farm. And, without a doubt, we love Memphis-style barbecue ribs with a dry rub, mop and slow smoking over applewood and hickory. Toss in some hot, vinegary Carolina barbecue sauce and Nirvana awaits. But we just made it into spring, the rains come and go, it’s still cold and the smoker needs to be set up (and we are tired from working in the garden). Time to turn on the oven. And there is nothing wrong with making ribs in the oven. In fact, some would argue that it may be a better place to cook ribs, assuming you use the right tools/technique and choose the right seasoning and sauce. The one thing that is really hard to do is get the deep smokey flavor and “smoke ring” color from the oven. But you can get very flavorful, tender ribs. As for the tools and technique, the main thing you need is some time, sauce (we will get there) and aluminium foil. The big thing with ribs is that they need to cook low and slow and, preferably, in a moist environment so they don’t dry out. This is particularly true for baby back ribs, which don’t carry much extra fat. But if you season and sauce the ribs and then wrap in a packet of foil, you can trap the juices from the ribs and gently steam the ribs for a few hours until they reach the desired temperature of 185 F. You need the temperature to get at least to 185 so the collagen in the meat turns to gelatin (that luscious texture) and the ribs get tender. Then you open the foil packets, add some more sauce and finish the ribs under the broiler for a few minutes to get a nice crispy, caramelized crust. Easy, but like most good things, you need a few extra steps. And now for the sauce. Since we don’t feel we can get a southern-style smokey flavor, we look more to Asian flavors. Instead of a base of ketchup, cider vinegar, Worcestershire and hot sauce, we go with ketchup, onion, garlic, soy sauce, rice wine vinegar and Sriracha. You get a familiar texture of barbecue sauce but the more Asian-inspired notes and some heat. And you can control the heat to your liking by just adding or subtracting Sriracha and/or some red pepper flake. Good stuff and good fun. One last note on cooking the ribs. 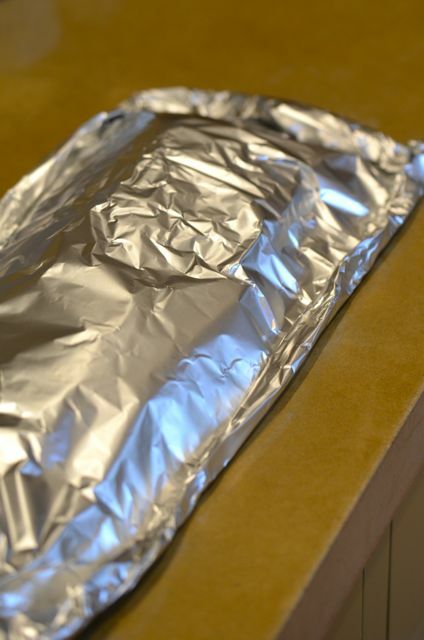 It will take about 2 hours baking in the foil to get tender ribs that still have a little “toothiness”. But if you like “fall-off-the-bone” tender ribs add another 15-30 minutes of cooking. And right about now you may hear a food snob someone say “technically ribs aren’t supposed to fall off the bone”. Hmmm. That may be true in barbecue contests, where they don’t want people “cheating” by boiling or steaming their ribs to make them more tender. But last we checked 99.99999% of ribs are cooked at home or restaurants, not contests. If you like “fall-off-the bone” ribs, go ahead and make them- just budget a bit more cooking time. We think that “technically” enjoying your food is the most important thing…..but we are silly that way. 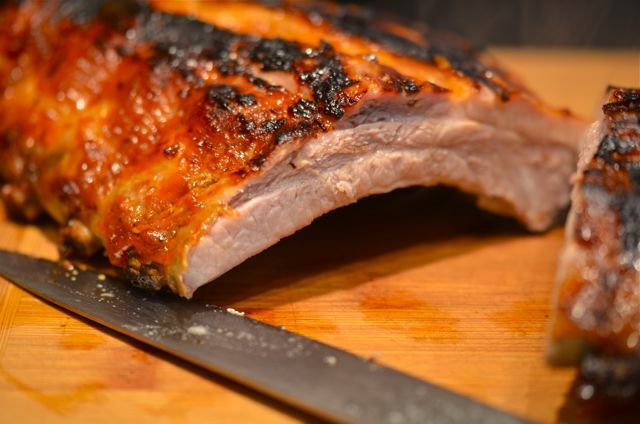 If you don’t want the Sriracha barbecue sauce you can use the same cooking method and rub the ribs with standard pork rub and then glaze with traditional barbecue sauce. You can substitute spare ribs for baby backs, and they will be very good. Just expect another 45-60 minutes of cooking time. 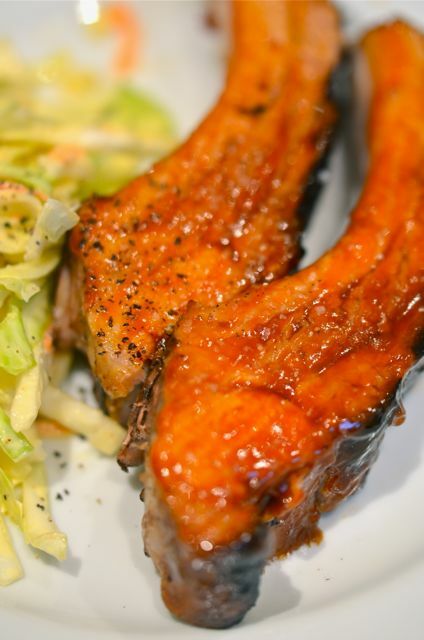 What You Get: Tender, flavorful ribs, with a hot, tangy sauce. All cooked indoors. What You Need: A lot of aluminium foil. Check your roll before you start. How Long? About 3 hours with 30 minutes of active time. Mostly a weekend dish, but easy to prepare ahead of time. 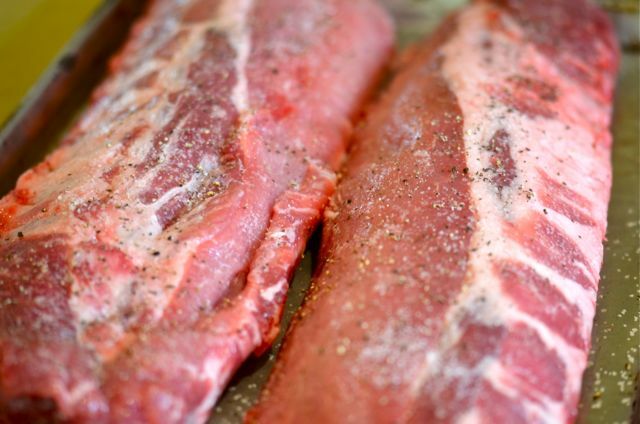 Place the ribs on a sheet pan and season liberally with salt and pepper. Place in the fridge while you make the sauce (you can do this up to 12 hours ahead). 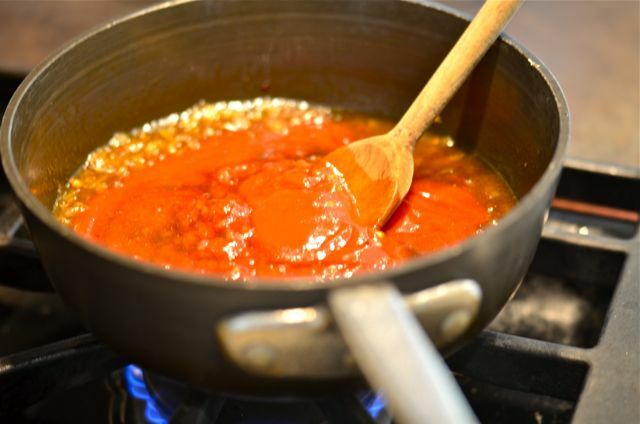 To make the sauce, place a medium saucepan over medium heat. When hot, add the oil and the onion. Sweat the onion for a few minutes until it starts to turn clear. Add the garlic and cook for 30 seconds. Then add the ketchup, brown sugar, molasses, soy sauce, vinegar and pepper flake. Bring to a boil and reduce the heat to low and simmer for about 20 minutes, stirring occasionally. Taste for heat and then mix in the Sriracha. Cook for another few minutes, taste and adjust seasoning, Sriracha and vinegar to taste. Remove from the heat and set aside. Place a rack in the middle of the oven and preheat the oven to 300 degrees. Lay out 2 very long strips (at least 2.5x the length of the ribs) of aluminium foil. Place the ribs, curved side up, on the aluminium sheets. Liberally glaze the ribs with some sauce. 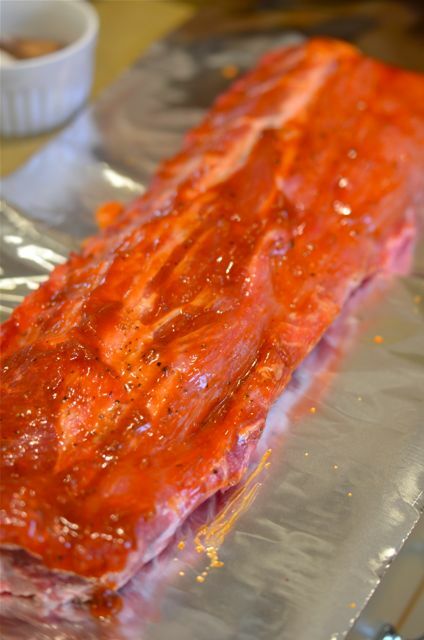 Fold the foil over the ribs and tightly fold/seal all around the ribs. Then place the ribs, curved side down, onto a baking sheet. Place the baking sheet in the oven. Bake the ribs in the oven for about 2 hours, or until very tender and the internal temperature is 185. (The foil packets may leak, this is OK). 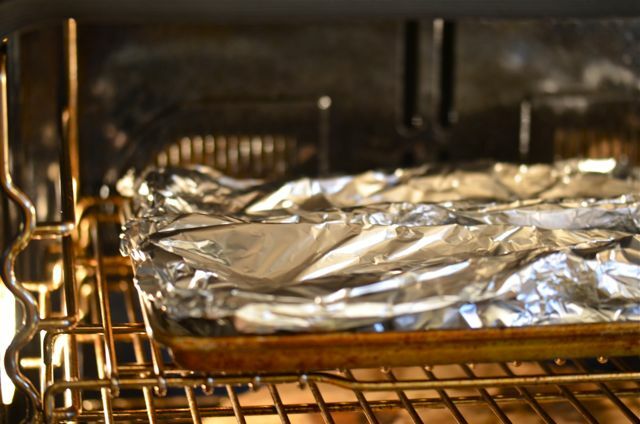 When done, remove from the oven, flip over the foil packets and open them so the curved side is up and exposed. Brush on more of the sauce. Move the oven racks to the top third of the oven (remember those oven mitts!) and turn on the broiler. Place the ribs back in the oven and broil until a nice dark crust forms about 5-10 minutes. Remove from the oven. Let the ribs rest for 10 minutes and then place then on a cutting board. Slice the ribs and brush them one more time with the sauce. Serve. Well, hello, ribs! Get in my belly! Well, let’s see if you are do easy ahi by the ocean in a sand pit with the green flash in the background. This is looking so good … love ribs too .. had lamb ribs yesterday, fantastic … I should have waited and used this recipe. The stickier the better … but 3 hours! Happy Easter. It’s 2.5-3 easy hours. Good time to have some friends over and enjoy a drink (or two). looks like a perfect rib sauce. Perfect time of year for them, too–still a bit of chill in the air screaming for warm foods. Like what you’ve done very much! I’m making this. 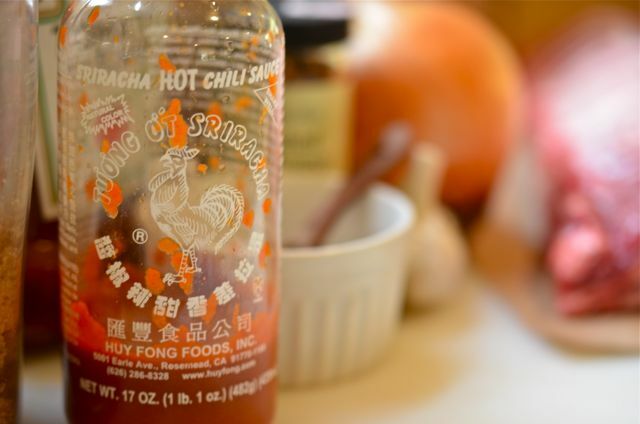 The sriracha is a great idea. My friend just told me that he made pork chops with sriracha and that they came out incredibly well. I would imagine that on ribs it’s be even better. I can also really appreciate using the oven when it’s still not easy to get to the grill/smoker. Thanks! (They were pretty good). I love making ribs in the oven. Problem is, the smell drives everyone crazy! 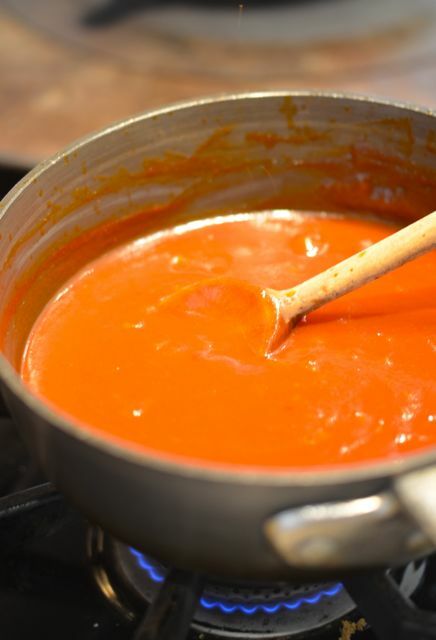 Now, this sauce looks divine. Falling off the bone appeals to me. I have kids in braces who aren’t supposed to eat things like corn or bagels or meat ‘on a bone’. And the sauce sounds heavenly. I never make ribs–that’s my brother’s forte, but he lives in Europe so I don’t get to enjoy his cooking all that often. Thank you for clear, easy to understand directions and photos! Made this recipe last night- and it was delicious! Halved the sauce because I only made one rack, and worked out perfectly. If I had more time, I’d cook it on a lower temp for 4 hours, but it was still tender and full of flavor. Thanks! Glad you liked it and thanks for letting us know! And 4 hours, lower and slower would be better…but like you said, it is all about time. I love making ribs in the oven, it takes a long time but it’s always a hit. 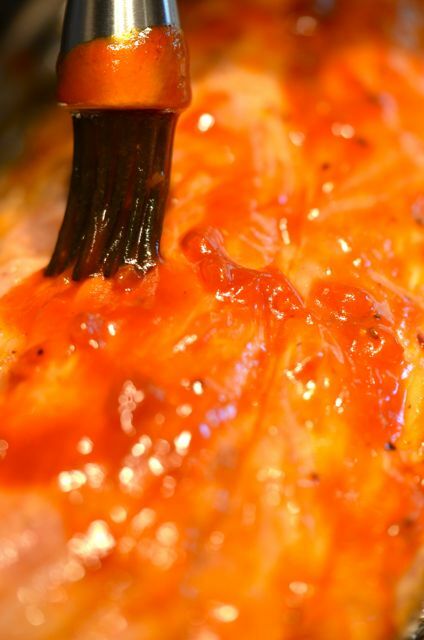 We forgo any sweet elements in our Hotter than Hell Sauce. But yours looks great! Hotter than hell sauce? Do tell…. Thanks- now playing with even hotter sauces. Surprisingly, the kids are into it. This looks excellent Have you adapted this recipe to use in a smoker yet? some sort of siracha marinade or rub? I hope siracha will be available for a long time to come, I read an article in the LA Times that they may shut down the Siracha factory over a smell dispute with city government. Just like a simple pencil, it takes a lot of people to mass produce delicious hot sauce. The City of Irwindale, CA wants to shut them down.